Winner to be announced by 9th November. 1.1 The Promoter is Swizzels Matlow Limited (‘Swizzels’), company number 00562269, whose registered office is at Carlton House, Albion Road, New Mills, High Peak, Derbyshire, SK22 3HA. 2.1 The title of the competition is ‘My Sweetest Invention’. 3.3 There is no entry fee and no purchase necessary to enter the competition. 3.4 By submitting a competition entry, the entrant agrees to be bound by these terms and conditions. 3.5 Entries will require a description and additionally can include a photo, sketch or video upload. Only one file must be submitted per entry and this must not exceed 20MB. Accepted file formats include: JPG, PNG, GIF, MP4, MOV, AVI, DOC, DOCX, PDF and PPT. 3.6 There is no limit to the number of entries an individual can submit. 3.7 Neither the Promoter nor it any of its employees, agents or representatives will be responsible for the non-receipt and or non-inclusion of entries in the competition as a result of being lost, late, illegible, incomplete, invalid, or because of technical failures or otherwise, including such failure which is in the control of the Promoter or its employees, agents or representatives. 3.8 By submitting a competition entry, the entrant is indicating his or her agreement to have their photograph or story shared on our public galleries including the Promoter’s website and on its Facebook, Instagram and Twitter pages. The Promoter will upload a selection of visual entries to the galleries to inspire others. 3.9 All competition entries must be received by the Promoter by no later than 17.00 GMT on 3rd September 2018 (‘the Entry Closing Date’). 4.1.3 members of the immediate families or households of the persons described in 4.1.1 and 4.1.2 above. 4.2 The Promoter reserves the right in its sole discretion to disqualify any individual whose conduct is contrary to the spirit or intention of the competition, or affects the administration, security, fairness, integrity or proper conduct of the competition. 5.1.1 After the Entry Closing Date, a panel of judges selected by the Promoter will select a shortlist of their four favourite sweet inventions from the entries submitted ('the Finalists'). Where the same idea has been proposed by more than one person, the judges will choose one person to be the finalist.The judge's decision will be final. 5.1.2 The Promoter will contact the Finalists either by email or social media to notify them that they have been shortlisted and to develop visuals that will be used for the public vote. If any of the Finalists cannot be contacted within seven days of notification, the Promoter reserves the right to remove them from the shortlist and select an alternative Finalist. 5.1.3 The four shortlisted sweet inventions together with the names and county of residence of the relevant Finalist will be displayed on the Swizzels website and on Swizzels’ social media channels from 1st October 2018. 5.2.1 Individuals will be invited to vote for their favourite using all social media channels. Only one vote will be permitted per individual. Multiple votes will be void and will not be counted. 5.2.3 Votes received across all Swizzels’ social media channels and the website will be counted. 5.3.1 The winner will be the Finalist which receives the most votes. 5.3.2 The winner will be notified by email within fourteen days of the Voting Closing Date. 5.3.3 The winner will be announced to the public on the Swizzels website and on Swizzels' social media channels no later than 9th November 2018. 6.1 The winner will be invited on a VIP tour of the Swizzels factory to see their entry come to life. This is a very rare opportunity to visit the factory in New Mills, Derbyshire, which is not open to the public. 6.2 The winner may bring one guest. 6.3 The visit date will be agreed with the Promoter. 6.4 The prize includes return travel expenses (standard class train fare or air fare if from Northern Ireland, Republic of Ireland, Channel Islands, Isle of Man or Switzerland), one night’s accommodation within the vicinity of the Swizzels factory at a hotel selected by the Promoter, transport from the hotel to the Swizzels factory and £200 spending money. 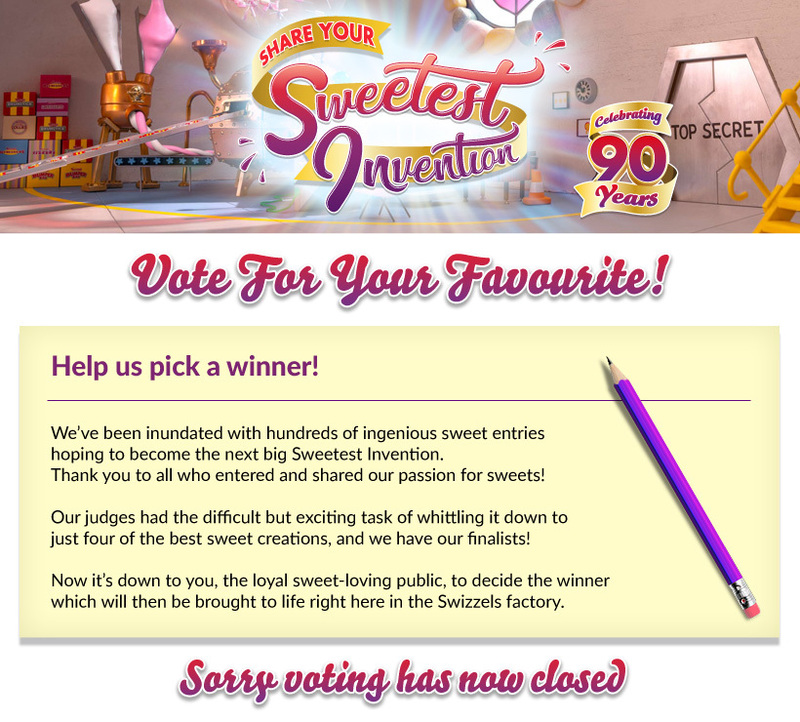 6.5 The 4 finalists will receive a prize of a gift hamper of Swizzels sweets. 6.6 The prize is non-transferable and no cash or other alternative is available. 7.1 By submitting an entry and any accompanying material the entrant agrees to assign to the Promoter all intellectual property rights with full title guarantee and waive all moral rights in and to the entry and otherwise arising in connection with the entry to which they may now or at any time in the future be entitled under the Copyright, Designs and Patents Act 1988 as amended from time to time and under all similar legislation from time to time in force anywhere in the world. 8.1 The winner and finalists agree to the use of his or her name and image in any publicity material or on social media. 8.2 Any personal data relating to the winner or any other entrants will be used solely in accordance with current UK data protection legislation. You are providing your information to the Promoter and its partner agency, RMS PR. 9.1 The competition and these terms and conditions will be governed by English law and any disputes will be subject to the exclusive jurisdiction of the courts of England. 9.2 The Promoter’s decision in respect of all matters to do with the competition and galleries will be final and no correspondence will be entered into. 9.3 The Promoter reserves the right to cancel or amend the competition and these terms and conditions without notice in the event of a catastrophe, war, civil or military disturbance, act of God or any actual or anticipated breach of any applicable law or regulation or any other event outside of the Promoter’s control. Any changes to the competition will be notified to entrants as soon as possible by the Promoter. 9.4 This promotion is in no way sponsored, endorsed or administered by, or associated with,Facebook, Twitter or any other social network.